This is a 1973 Nishijin side light cover strip. 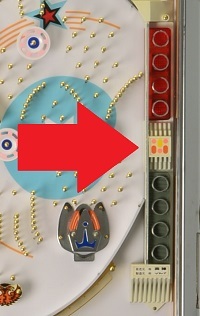 The red lights can be illuminated from the rear if your machine is set up for it, the green is opague. We make sure the plastic on the strip is bright and free from burns, cracks, or chips. They are at least a 9 out of 10 and will look great on your machine.